The food and service in the main dining hall (Cosmopolitan) were top-notch. We didn&apos;t feel like we could be missing anything important at Blu (Aqua-class) or Luminae (Suite-class) -- whatever is happening in those fancier restaurants is by definition either redundant or wretched excess. Our concierge-class balcony room (8173) was delightful. Service throughout the ship was excellent. We had a couple problems (e.g., cabin thermostat broke) that were dealt with quickly and professionally. And we had a great time overall. Still, there were so many unforced errors that we&apos;ll try a different cruise line next time. First, to celebrate the holidays, Celebrity raised the price of meals in the specialty restaurants to $60 per person, with no package discounts. That&apos;s out of reach for normal people, which means most cruisers get the Buffet or the Dining Hall and that&apos;s it -- which isn&apos;t exactly a hardship, but we have enjoyed specialty dining elsewhere. Second, the CASTE SYSTEM is laid on way too thick by Celebrity. Even the normal price of specialty restaurants on the Summit ($45) is 50% higher than on the Crown Princess ($29), and so if you&apos;re priced out of those -- you are also literally locked out of Aqua, Luminae, and Michael&apos;s Club -- that&apos;s a lot of places you can&apos;t go. And if you don&apos;t want to shop for overpriced luxury goods or gamble in a rigged casino, then most of the ship is off limits. Third, although the theater performances were better than on the Crown Princess (very low bar), the lounge and atrium performers were uniformly mediocre, and they detracted from the ambience nearly always, but most of all in the atrium where blasted music made it difficult to converse or to work with guest relations. Fourth, no doubt because this cruise was over the holidays, the sense of crowding was constant. The lines for ice cream were unremitting and we never got any. We waited as much as 40 minutes for a table at dinner. Peak time at the buffet was a shark feed. Fifth, the Buffet mostly shuts down between meals (except for pizza and pasta), which unnecessarily creates crowding and constrains schedules. Sixth, if you enjoy the ambience of the big airy atrium/piazza on some ships, you&apos;ll miss it on the Summit. Seventh, the destination lectures were a joke, hosted by some dingbat whose only agenda was to pitch shopping, especially jewelry, and who broke numerous laws when she assured us that investing in loose diamonds was a no-brainer because their value only goes up. This was insulting and bordered on outrageous. It&apos;s okay for Celebrity to have a shopping show, but they need to describe it as such, and not offer it INSTEAD of an actual destination lecture. Eighth, Princess refugees will miss the self-service laundromat that they left behind, because the Summit doesn&apos;t have any. One really interesting thing about the Summit is that they match you with the same dining room team (waiter/assistant/sommelier) EVEN if you choose any time dining, which really is the best of both worlds. They do this so that you can give a reliable review of the service and they can know who you are talking about when you rate the service. In fact, there&apos;s a slightly weird vibe on the ship that everyone is worried about getting yelled at by their manager for not providing five-star service, which, ironically, is not five-star service. If you&apos;re curious what Concierge Class (one-step above proletariat) gets you, it&apos;s not much -- daily hors d&apos;oevres and fruit in your room, maybe a shorter dinner line if you lack reservations, and one extra person to call if you need help with something. Overall, Celebrity Summit cured a bunch of problems that plagued the Crown Princess, but introduced its own problems, so I found the two ships comparable. If on another voyage the Summit were less crowded, had more staff, offered reasonably priced specialty dining, and upgraded their lounge acts, I would give it the edge. No Celebrity Summit review would be complete without mentioning Donovan, the sunshine coffee man, who circles the buffet each morning with a new songs about free coffee and tea -- what a treasure! The food and service in the main dining hall (Cosmopolitan) were top-notch. We didn&apos;t feel like we could be missing anything important at Blu (Aqua-class) or Luminae (Suite-class) -- whatever is happening in those fancier restaurants is by definition either redundant or wretched excess. Our concierge-class balcony room (8173) was delightful. Service throughout the ship was excellent. We had a couple problems (e.g., cabin thermostat broke) that were dealt with quickly and professionally. And we had a great time overall. Still, there were so many unforced errors that we&apos;ll try a different cruise line next time. First, to celebrate the holidays, Celebrity raised the price of meals in the specialty restaurants to $60 per person, with no package discounts. 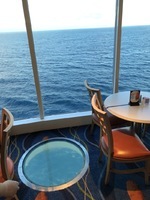 That&apos;s out of reach for normal people, which means most cruisers get the Buffet or the Dining Hall and that&apos;s it -- which isn&apos;t exactly a hardship, but we have enjoyed specialty dining elsewhere. Second, the CASTE SYSTEM is laid on way too thick by Celebrity. Even the normal price of specialty restaurants on the Summit ($45) is 50% higher than on the Crown Princess ($29), and so if you&apos;re priced out of those -- you are also literally locked out of Aqua, Luminae, and Michael&apos;s Club -- that&apos;s a lot of places you can&apos;t go. And if you don&apos;t want to shop for overpriced luxury goods or gamble in a rigged casino, then most of the ship is off limits. Third, although the theater performances were better than on the Crown Princess (very low bar), the lounge and atrium performers were uniformly mediocre, and they detracted from the ambience nearly always, but most of all in the atrium where blasted music made it difficult to converse or to work with guest relations. Fourth, no doubt because this cruise was over the holidays, the sense of crowding was constant. The lines for ice cream were unremitting and we never got any. We waited as much as 40 minutes for a table at dinner. Peak time at the buffet was a shark feed. Fifth, the Buffet mostly shuts down between meals (except for pizza and pasta), which unnecessarily creates crowding and constrains schedules. Sixth, if you enjoy the ambience of the big airy atrium/piazza on some ships, you&apos;ll miss it on the Summit. Seventh, the destination lectures were a joke, hosted by some dingbat whose only agenda was to pitch shopping, especially jewelry, and who broke numerous laws when she assured us that investing in loose diamonds was a no-brainer because their value only goes up. This was insulting and bordered on outrageous. It&apos;s okay for Celebrity to have a shopping show, but they need to describe it as such, and not offer it INSTEAD of an actual destination lecture. Eighth, Princess refugees will miss the self-service laundromat that they left behind, because the Summit doesn&apos;t have any. One really interesting thing about the Summit is that they match you with the same dining room team (waiter/assistant/sommelier) EVEN if you choose any time dining, which really is the best of both worlds. They do this so that you can give a reliable review of the service and they can know who you are talking about when you rate the service. In fact, there&apos;s a slightly weird vibe on the ship that everyone is worried about getting yelled at by their manager for not providing five-star service, which, ironically, is not five-star service. If you&apos;re curious what Concierge Class (one-step above proletariat) gets you, it&apos;s not much -- daily hors d&apos;oevres and fruit in your room, maybe a shorter dinner line if you lack reservations, and one extra person to call if you need help with something. Overall, Celebrity Summit cured a bunch of problems that plagued the Crown Princess, but introduced its own problems, so I found the two ships comparable. If on another voyage the Summit were less crowded, had more staff, offered reasonably priced specialty dining, and upgraded their lounge acts, I would give it the edge. No Celebrity Summit review would be complete without mentioning Donovan, the sunshine coffee man, who circles the buffet each morning with a new songs about free coffee and tea -- what a treasure! Beautiful and spacious; cabin steward Garfield kept everything immaculate. An adjoining door connects to 8175, which we asked to be unlocked, and that was a real convenience. The walls were so amazingly sound-proof that you had to say, "Come in!" pretty loudly or the person in the adjoining room could not hear you. Plenty of storage. The room is far to the aft, but no particular engine vibration was noted, nor any other noise from above or below. I saw both rust and peeling paint, but it did not impact our enjoyment of the cruise even slightly -- I can&apos;t fathom why people talk about this. NB: no electricity in the bathroom, so leave your water pick at home unless it is battery operated. Booked through Celebrity the excursion called "Dominica&apos;s Favorites" -- the tour guide, Crisca, was outstanding, and really gave us a great sense of the island and it&apos;s culture, plus guidance on how to catch Mountain Chickens (but don&apos;t, because they are endangered). The Emerald Pool is underwhelming and the water is either "cold" or "refreshing," depending on your attitude. Many people swam, and were photographed in, around, or behind the waterfall. The walk down to the pool is well-paved steps through a beautiful rain forest. Booked through Celebrity the excursion called "Dominica&apos;s Favorites" -- the tour guide, Crisca, was outstanding, and really gave us a great sense of the island and it&apos;s culture, plus guidance on how to catch Mountain Chickens (but don&apos;t, because they are endangered). The walk to the falls is well-paved steps up through a beautiful rain forest. The falls themselves are impressive. During the 30-minute drive to the Volcano trailhead, the tour guides mostly channel-surfed through talk-radio and Christian rock (e.g., "Our Lord and Savior Jesus Christ") instead of telling us about the island&apos;s history or their own experience of life on the island. I can tell you more about how to enter the KFC drawing to win $3,500 EC dollars by submitting your receipt than I can tell you about the history of the volcano we were to climb. That was inexcusable. On the volcano, the guides were very competent, which was a good thing, because it is a very strenuous climb to the top, and only the fittest made it. The path is muddy if it&apos;s been raining, and because it is through a rain forest, it likely has been raining. For us, the path was VERY muddy, and tour guide Rashidi saved my life a couple times (or at least saved me from getting COMPLETELY covered in mud) as I lost my footing both ascending and descending "Slippery Hill." The top of the volcano was shrouded in fog, so nobody saw anything. I think most people were glad they went, because it is an amazing hike through a rain forest, even if you don&apos;t make it to the top. If the guides would turn off the radio and instead introduce us to the island and to the adventure, I would give this tour a very high rating and encourage participants to (1) bring very sturdy mud boots, (2) do NOT attempt the hike without a walking stick, and (3) skip it if you&apos;re not a pretty serious hiker.